Get Well Soon | Awesomeness For Awesome's Sake. Oh man, I was just over on Roarin’ Rick‘s page and saw that comix legend, S. Clay Wilson, was involved in some sort of dust up that has left him hospitalized and in serious condition. I’ve loved his depraved drawings since I was in my late teens. 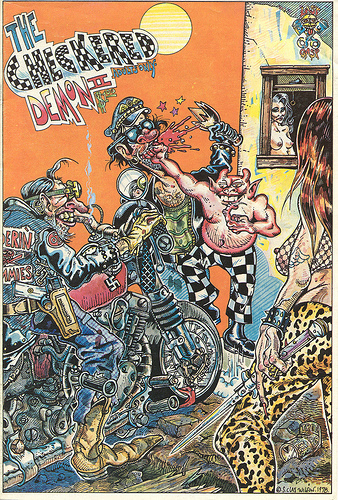 Sure, Crumb gets most of the accolades for the underground comix scene, but S. Clay Wilson really captured my imagination and influenced my drawing style with his crazy bikers, pirates, degenerates, and dope fiends. There’s a pretty cool interview at The Comics Journal with the man behind The Checkered Demon and Captain Pissgums if you want to learn a little bit about what makes a feller draw so many blow jobs and beheadings. Get well soon, Mr. Wilson! I’m pulling for ya’!